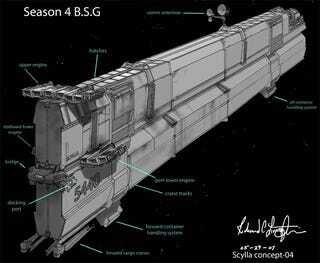 Check out this incredibly detailed sketch of the Scylla, the civilian transport ship that the Battlestar Pegasus left for dead in Battlestar Galactica: Razor. Designer Richard Livingston actually thought through which parts of the ship would be for communications, as opposed to the bridge, hatches and engine sections. Livingston gave some of his original concept art for Razor and the rest of season four to the amazing Concept Ships art. Check out his original sketch of how the old-school Cylon centurions would look in the new show.